Basil is an important economic crop producing annually c.100 tonnes of essential oil worldwide and with a trade value as a pot herb of around US$15 million per year. It is also widely used in systems of indigenous medicine. 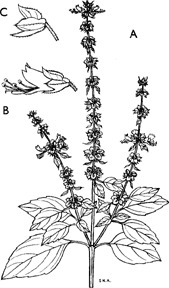 Ocimum basilicum, commonly known as basil, is an aromatic annual herb and an important economic crop. 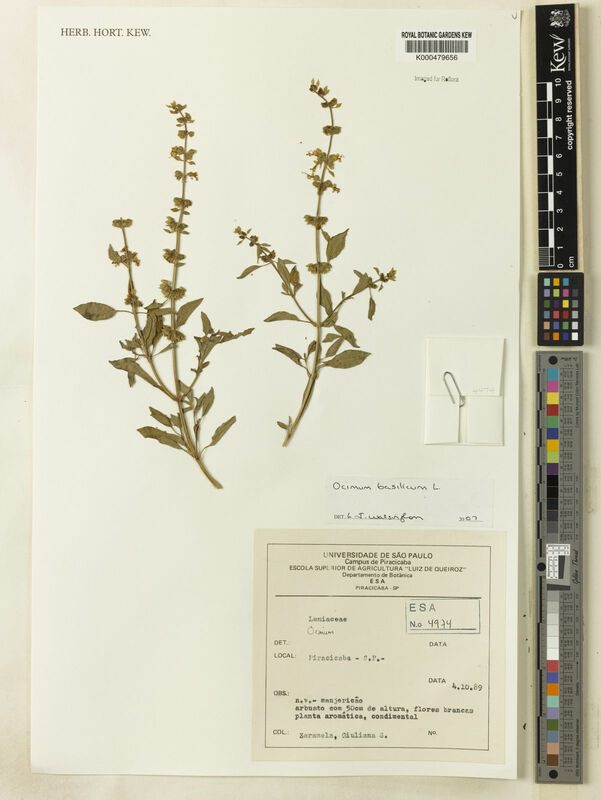 Much confusion surrounds basil taxonomy with several forms having different attributes being recognised under the same name. However, a study by Dr Eli Putievsky of Newe Ya'ar Research Centre, Haifa, Israel, working with Alan Paton during a sabbatical year at Kew, used analysis of chromosome numbers and essential oils alongside morphological descriptions to investigate a standardisation of the approach. This type of work is extremely important in order to develop the full economic and medicinal potential of plant species. Tropics of Asia and Africa; widely cultivated elsewhere. Ocimum basilicum is an aromatic, annual herb, 0.3-0.5 metres tall, but some cultivars can reach up to 1 m. The plant is almost hairless. Some cultivars, such as the 'Dark Opal', have leaves and stems deep purple in colour. The leaves are ovate, often puckered, flowers white or pink, and fruits have four small nutlets, which are mucilaginous when wet. 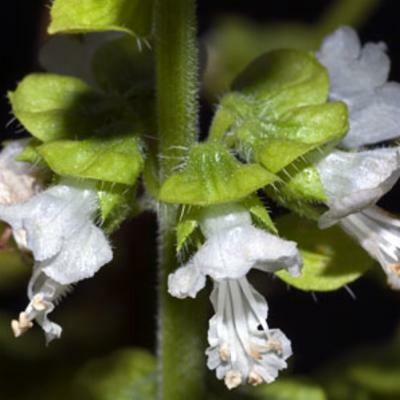 Ocimum basilicum is closely related to and frequently confused with Ocimum africanum and Ocimum americanum , but they can be identified on the basis of indumentum (hair distribution) and flower size. Lemon-scented cultivars are usually the result of crosses between O. basilicum and O. africanum . Basil is used to flavour soups and sauces and is the main ingredient of pesto sauce. The leaves can be eaten as a salad. 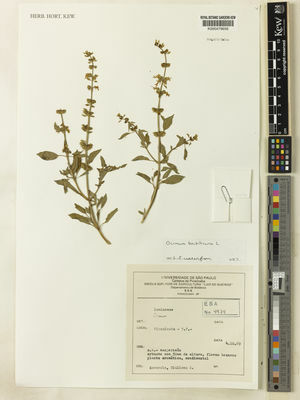 Basil is also used in perfumery, soap-making, and to flavour liqueurs. The seeds are edible, and when soaked in water become mucilaginous. In parts of the Mediterranean they are made into a refreshing drink known as cherbet tokhum. 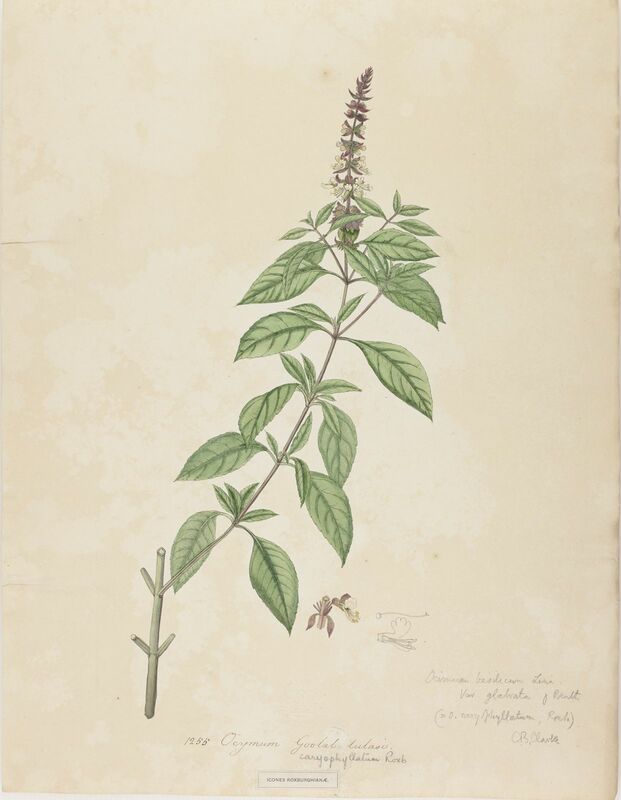 Basil is widely used in systems of traditional medicine, including Ayurveda and traditional Chinese medicine. It is used for treating digestive system disorders, such as stomach ache and diarrhoea, kidney complaints, and infections. In Africa, for example, it is used for treating whooping cough and various types of fever. The leaves are pulped in water to make ear- and eye-drops in parts of west Africa, and a leaf decoction is used for treating coughs. 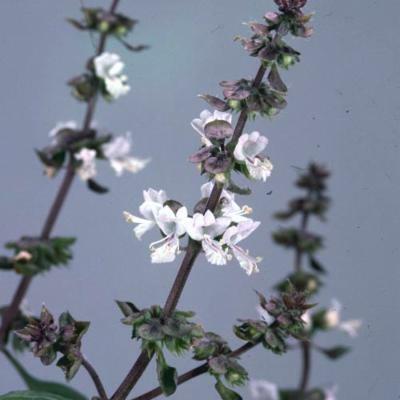 Unlike other herbs grown in the same family (Lamiaceae) such as rosemary, sage and mint, basil is tropical in origin and as a result is not frost-hardy. Cultivada en Colombia; Alt. 0 - 1700 m.; Amazonia, Andes, Islas Caribeñas, Llanura del Caribe, Pacífico, Sierra Nevada de Santa Marta, Valle del Cauca, Valle del Magdalena. Least concern though it is unclear where this species is native of. 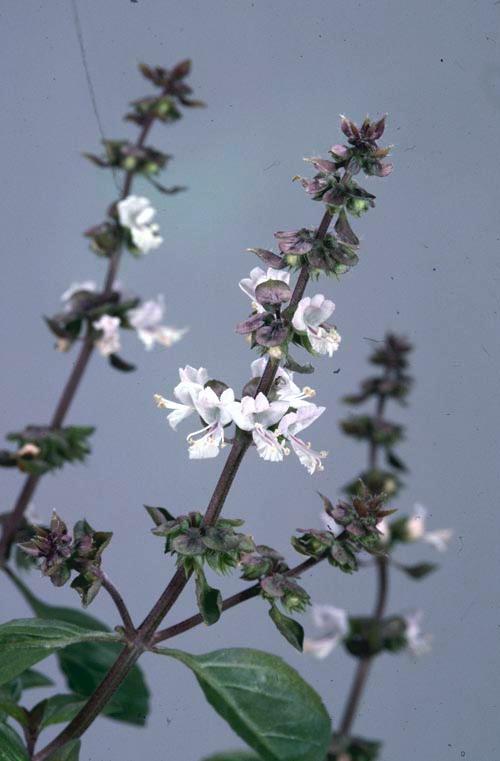 O. basilicum, Sweet Basil, is grown commercially elsewhere for its essential oils and a number of varieties have been proposed. Paton & Putievsky, loc. cit. (1996), suggest that none of these should be given formal varietal rank. One of them, formerly commonly known as var. difforme Benth., with laciniate leaves, has been cultivated on Pemba ( Vaughan 635). Food, perfume, flavoured liqueurs, medicine, insecticide. Ocimum ciliare B.Heyne ex Hook.f. 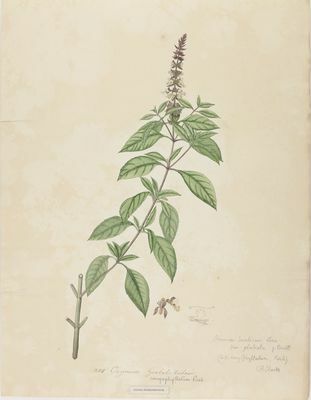 Ocimum lanceolatum Schumach. & Thonn. Ocimum laxum Vahl ex Benth. Ocimum nigrum Thouars ex Benth. 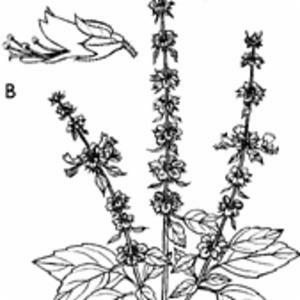 Ocimum scabrum Wight ex Hook.f. Paton, A.J., Bramley, G., Ryding, O., Polhill, R.M., Harvey, Y.B., Iwarsson, M., Otieno, D., Balkwill, K., Phillipson, P.B., Harley, R.M. & Willis, F. (2013). Flora Zambesiaca 8(8): 1-346. Royal Botanic Gardens, Kew. Manikandan, R., Chandrasekar, K. & Srivastava, S.K. (2012). 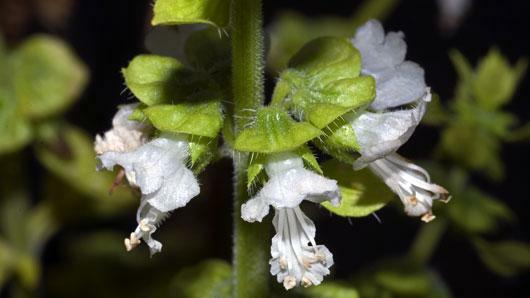 Life form analysis of the family Lamiaceae in Jammu & Kashmir, India Phytotaxonomy 12: 7-19. Morales, R. (2011). 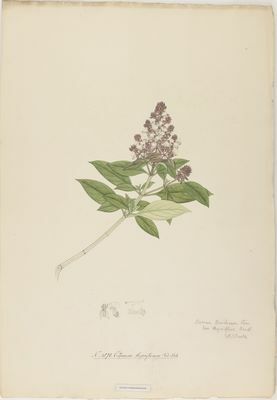 Les Labiadas (Lamiaceae) de Guinea Ecuatorial Anales del Jardin Botanico de Madrid 68: 199-223. Paton, A.J., Bramley, G., Ryding, O., Polhill, R., Harvey, Y., Iwarsson, M., Willis, F., Phillipson, P., Balkwill, K., Lukhoba, C., Otiend, D & Harley (2009). Lamiaceae (Labiatae) Flora of Tropical East Africa: 1-430. Khanam, M. & Hassan, M.A. (2008). 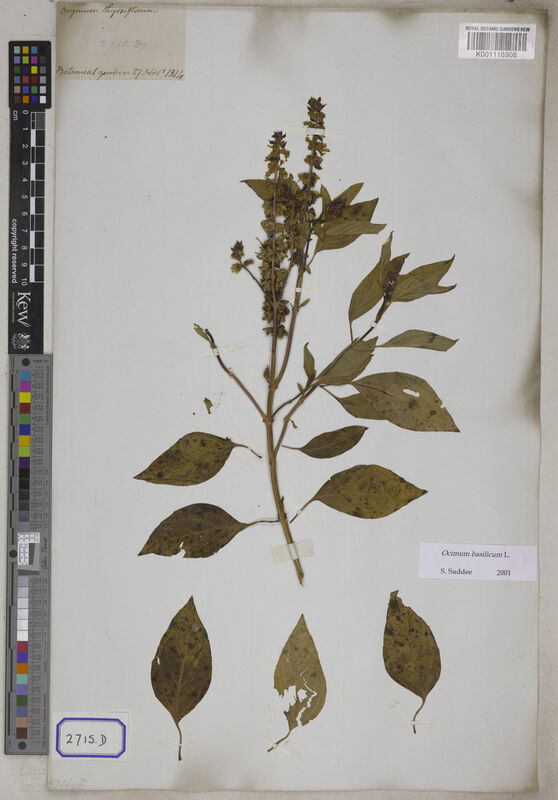 Lamiaceae Flora of Bangladesh 58: 1-161. Bangladesh National Herbarium, Dhaka. National Parks Board Singapore (2006). Vascular Plant Life Checklist Pulau Ubin www.nparks.gov.sg/nparks_cms/cms/cmsmgr/data/6/PlantChkList.xls. Suddee, S., Paton, A.J. & Parnell, J.A.N. (2005). Taxonomic Revision of the tribe Ocimeae Dumort (Lamiaceae) in continental South East Asia III. Ociminae Kew Bulletin 60: 3-75. Mabberley, D.J. & De Kok, R.P.J. (2004). Labiatae Flore de la Nouvelle-Calédonie et Dépendances 25: 20-141. Muséum National d'Histoire Naturelle, Paris. Dales, M.J. (1996). A Review of Plant Materials Used for Controlling Insect Pests of Stored Products. Natural Resources Institute, Chatham. De-Baggio, T. & Belsinger, S. (1996). Basil: An Herb Grower's Guide. Interweave press, Loveland. Burkill, H.M. (1995). The Useful Plants of West Tropical Africa, Vol. 3: Families J-L. Royal Botanic Gardens, Kew. Hedrick, U.P. (ed.) (1919). Sturtevant’s Notes on Edible Plants. New York (State) Dept. of Agriculture, 27th Annual Report, Vol. 2 Part II. Lyon, Albany. SEPASAL (Survey of Economic Plants for Arid and Semi-Arid Lands). Fl. Eth. 5: 571 (2006).